The Bullmastiff was bred specifically to help protect estates from poachers. Today are still used as guard dogs worldwide, but they are also commonly kept solely as companions. The Bullmastiff is a breed of dog that originated in England. Just as their name suggests, it was developed from a cross between the old-style Bulldog and Mastiff. Breeding for the Bullmastiff began in the 1800s by gamekeepers of large estates and game preserves to chase down poachers. The Mastiff was not quite aggressive enough and lacked the speed for pursuit, while the old-style Bulldog was overly ferocious and small. By crossing the two breeds they developed the dog seen today, keeping the bloodline 60% Mastiff to only 40% Bulldog. 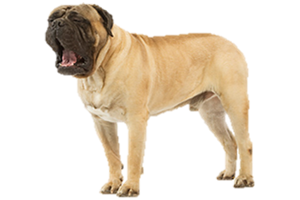 Is the Bullmastiff Right for You?